Born in Ecuador and raised in Toronto, Robert Bravo’s musical education began at St. Michael’s Choir School where he received training in sacred and secular Choral music, Classical piano and Classical guitar. He went on to complete a Bachelor of Music at Capilano University in Vancouver, majoring in Jazz piano. Robert’s performance experience includes Choral music, Rock/Pop bands, Classical ensembles, Jazz ensembles, Celtic music and Folk music. He has performed at Massey Hall, Roy Thomson Hall and the Queen Elizabeth Theatre in Vancouver. He has participated in numerous original music recordings spanning Rock/Pop, Electronica and Jazz. Robert’s biggest musical influences include The Beatles, The Who, Afro-Cuban Music, The Police, Debussy, Brad Mehldau and Kurt Rosenwinkel. His current musical interests include Film Music, Electronic Music, Blues and listening to The Robert Glasper Experiment. 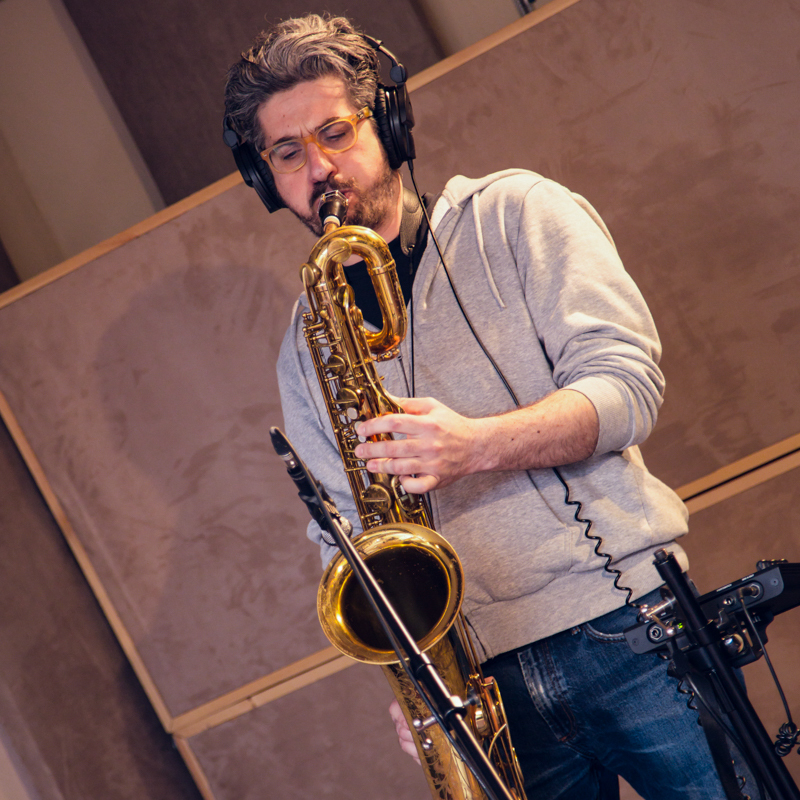 Marco Bonatti is equally comfortable on the alto, tenor and baritone saxes, and also enjoys playing a little bit of guitar. His musical training started with the local marching band in his hometown of La Spezia, Italy when he was 9 years old. Private Jazz lessons and Jazz combo classes followed with Marco eventually attending a Jazz Masterclass in Siena, Italy. He has played in marching bands, duos, Jazz quartets, Gospel choirs, Big Bands, Folk and Popular music groups. Marco has performed in many musical settings ranging from small clubs to local music festivals. 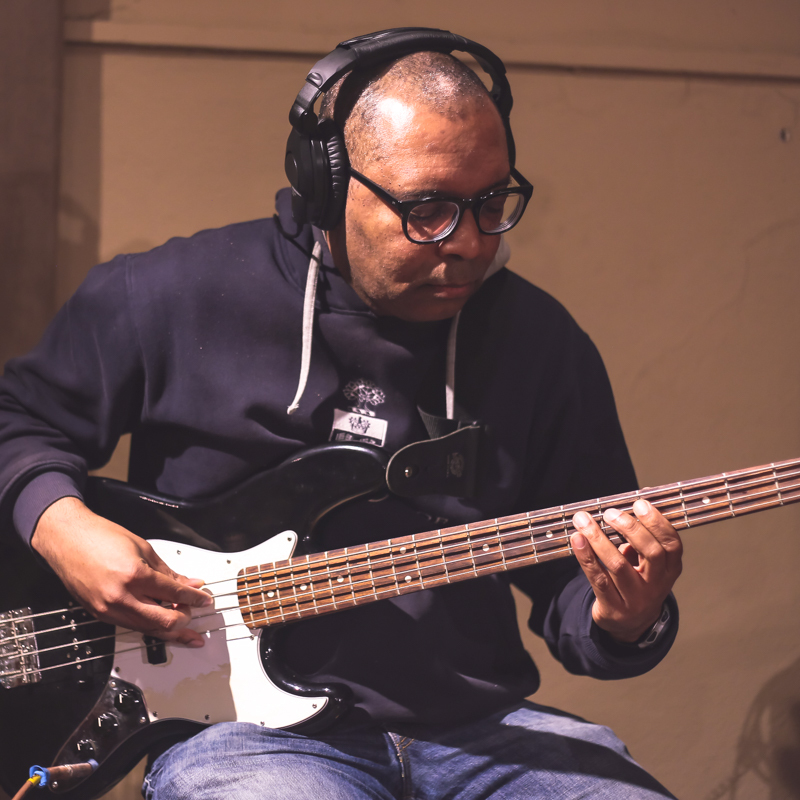 He has been influenced most importantly by Cannonball Adderly, Joe Henderson, Sonny Rollins, John Coltrane, Thelonius Monk, Charles Mingus, Lee Morgan, Bob Marley and Pepper Adams. These days Marco is listening to New Funk, Brass Band street music, Daptone Records artists and plenty of straight-ahead Jazz. 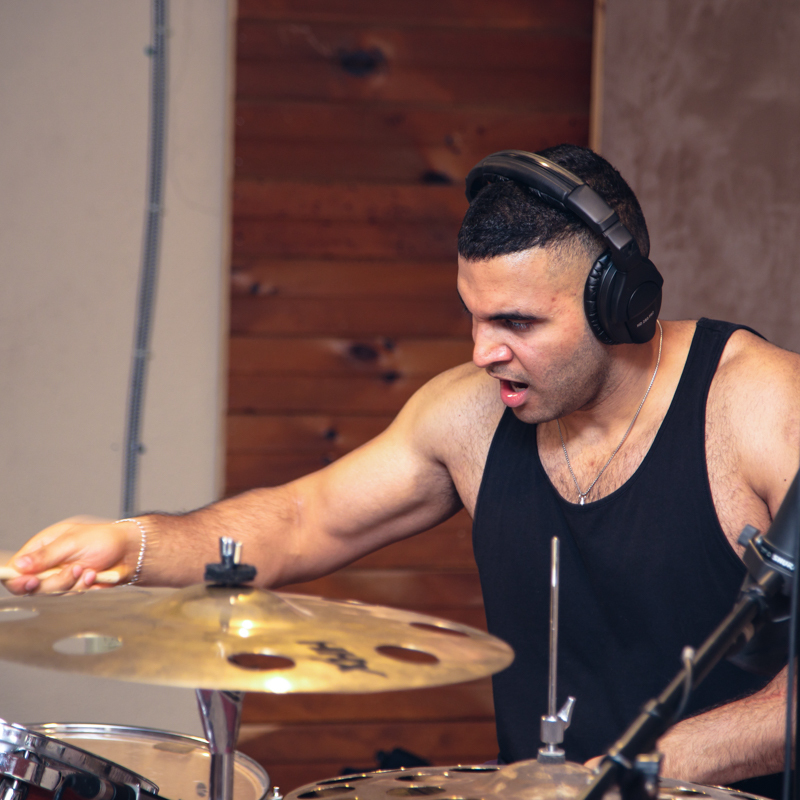 Benjamin Thomas is a hard-hitting drummer with additional skills in piano, electronic pads, and music production. Hailing from Brampton, he is a self-taught musician with extensive performing experience and has performed at notable venues such as the Phoenix Concert Theatre, Toronto’s Yonge/Dundas Mainstage, the Payal Banquet Hall, the Harvest Performance Hall and the Mississauga Living Arts Centre. Ben has played a wide variety of musical styles: Big Band Jazz, Indie Rock, Funk, Experimental Rock, Alternative Rock and Christian Rock/Gospel. He counts Snarky Puppy, Rufus Du Sol, Kendrick Lamar, and MuteMath as some of his biggest influences. Ben has done recordings with WonByOne Music Group and Red Nightfall, and has written reviews for the TD Toronto Jazz Festival. Currently Ben is exploring experimental fusion between Electronic music, Jazz, Hip Hop and Soul. A native of Brampton, guitarist Richard Dao studied privately with respected ex-Toronto Jazz guitarist Sean Bray who CBC Radio calls one of Canada’s top 50 guitarists of all time. 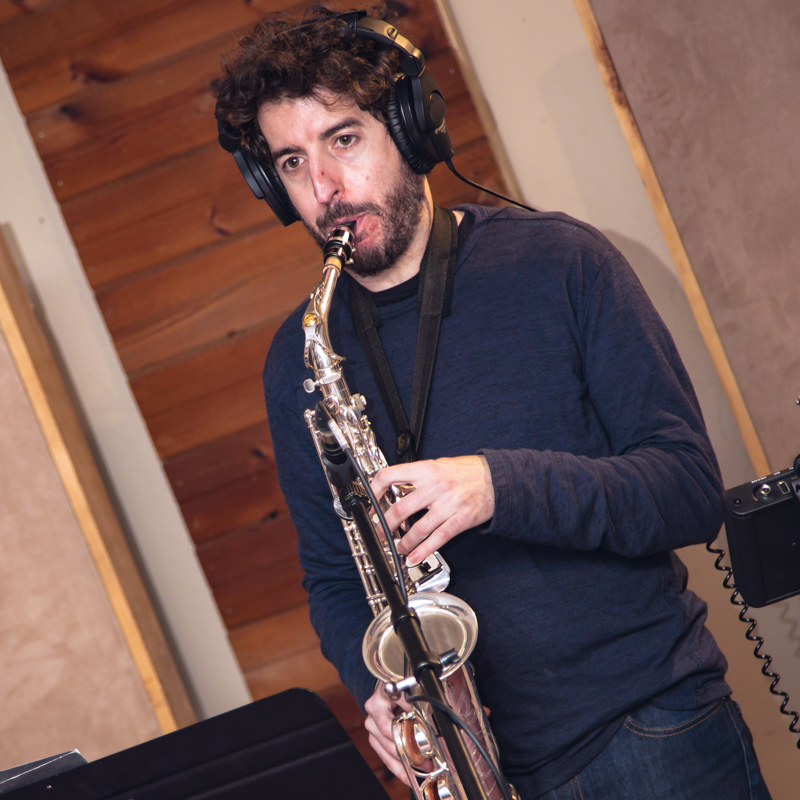 He also attended renowned Toronto saxophonist David Rubel’s Jazz Ensemble Group classes. Richard has played with the Jazz Quartet Ensemble and Garage Rock band The Mistakes. He has played Brazilian Pop and Bossa Nova as a session player for Bruno Capinan. Richard has performed at Toronto venues The Cameron House, The Hideout and Junction City Music Hall. His musical influences include John Mayer, Prince, Tuck Andress, D'Angelo, Stevie Wonder and Earth Wind & Fire. Richard is currently experimenting with writing solo guitar pieces that blend neo-Soul grooves and Shidaiqu – traditional Chinese Folk music with Jazz rhythms.